This package contains common dithering patterns and brushes, created for Photoshop CS5 and later. There is some logic in the design of these brushes. Which shows you that most dithers are made from others of lower density, and have the inverse of themselves. This will make sense when you see the names of the patterns and brushes. Download from abductedPlatypus.itch.io, where I will also upload updated versions of this package. * If you don't understand this text, please tryout the Brushes a bit first, it should make sense after trying them out for a bit. 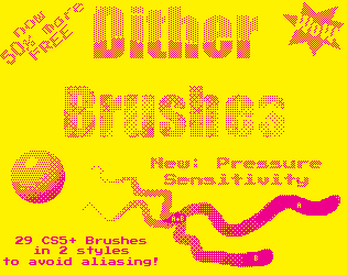 Also checkout this if you need "simple" dithering for backgrounds. If you have any ideas to improve these brushes let me know as a comment on this post, and I will check out how I can get it to work and make it as a brush in Photoshop! P.S. I made a short blog post about dithering and how this tool works. Can you make a version for GIMP? I haven't used that in years. A quick google told me that it should work out-of-the-box? But since I am an open-source developer I would support the idea of getting it to work in GIMP, I might give it a look in the next week, if I can find the time. Since I use the Texture mode for these Brushes, which is not supported in GIMP. Importing into GIMP nor recreating will work. Since I packed the used patterns with it you could import and use those with the Clone tool in GIMP with alignment set to Aligned or None, depending on your needs. (This also works in Photoshop with the Pattern Stamp with aligned turned on/off). Then use (layer) blending (e.g. Darken) and opacity options to change the color. This does not allow pressure sensitivity in the way I have set it up in Photoshop and is far from ideal since you would need to use blend mode to get it right. This is all I can give you to make your dithering easier in GIMP until Texture is possible on brushes in the same way as it is in Photoshop. I hope it might help!